With March being women's history month and St. Patrick's Day around the corner I wanted to check out what's going on with my Irish sisters this Feel Good Friday. Turns out, these are some very busy ladies! The National Women's Council of Ireland has been around since 1973. Their mission, as stated on their website, is "to lead and to be a catalyst for change in the achievement of equality between women and men. They work with women in the areas of leadership, health care, economic independence, care and care work, reaching out to young people and building the women's movement. This can include increasing women's participation in politics, the media and the boardroom, fighting for reproductive rights and equal pay and empowering young people. Whew! 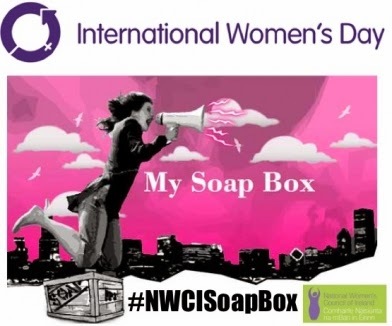 On International Women's Day (March 8th) they set up a pop up Soap Box in Dublin so women could have a public forum to speak their minds. From the photos on Twitter it looks like it was a well attended, successful event. Anyone in Ireland who's reading this blog can get very actively involved with the group. The rest of us can follow the news on their Facebook page. Now that you know what's going on... Lá Fhéile Pádraig Sona Daoibh!